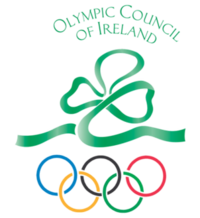 The detailed report on the Irish Mens European Curling Championship performance below was taken from the Olympic Council of Ireland website. 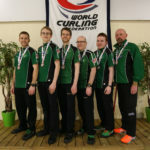 As part of the Irish Curling Association’s four-year campaign to qualify for the Beijing Winter Olympics in 2022, Ireland’s men’s team won bronze yesterday at the European C Division Championships in Denmark, missing out on promotion to the B Division by just one shot. The team – John Wilson, Andrew Gilmore, Craig Whyte, John Furey and alternate Eoin McCrossan – took Belarus to an extra end in the play-off for the last promotion place but went down 6-5 after Belarus took one shot in the 11th end. Eight European teams played out a round-robin over the five days of competition and, after finishing on a four-win, three-loss record, Ireland, coached by Martin Sutherland, found themselves in third position behind Denmark and Belarus, thanks to their superior score in the pre-game draw shot challenge. On Monday morning they beat the fourth placed team Bulgaria 12-4 to guarantee them at least the bronze medal. In the afternoon they were back on the ice in the Tarnby Ice Centre playing for silver against the loser of the 1 v 2 gold game between Denmark and Belarus – Belarus. The stakes were high as the Irish and the Belarusians battled hard over 11 ends for both the silver medal and the second promotion spot to the European B Division Curling Championships in Estonia in November 2018. A very tense game started off with a blank end. The teams then swapped the hammer over the next five ends but Belarus managed two shots each time whilst Ireland found only singles. A blank in the eighth end followed by a one in the ninth left the Irish lads looking to steal a two in the tenth, which they dramatically did to tie the scores at 5-5, forcing the match into an extra end decider. Unfortunately, after a three-hour tussle, Ireland were not able to prevent the Belarusian skip, Pavel Petrov, taking out the Irish shot stone, with the last stone of the game, to take the silver and the promotion berth. Irish team spokesperson John Furey said afterwards: “Once again the Irish men’s curling team have failed to secure either the gold or silver medal and qualification to the European B group. Again, we were left with the bronze medal. “The week began fairly slowly with two losses to Belarus and Belgium. A large part of this can be put down to our new back end of John Wilson and Andrew Gilmore as this was their first time together at a European level competition. Thereafter the team played very solidly working their way up from the bottom of the group after day one to third at the end of the group stage. – The draw shot challenge of ~31.35 cm which was the best across all teams and comparable to the type of values posted by teams in the world championship. This included a LSD of 7mm. Additionally, three of the top five last stone draws were by the Irish team. – We scored the biggest end of the week a 6 against Andorra while the max we conceded was a 3. “On the final day we had two games to play. The first was against Bulgaria and we beat them fairly easily with our best and most consistent play. This is the Irish men’s team fourth bronze medal in five years in the European C Division. 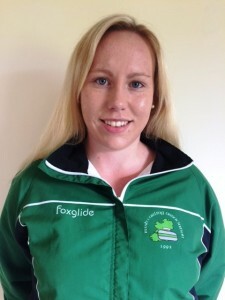 The ultimate goal is promotion first to the B Division and then up to the elite A Division where a top seven ranking qualified Ireland for the Olympic Games. The team, who range in ages from 19 to 50 are completely self-funded and hold down full-time jobs while pursuing their dream of becoming Olympians. The Irish Times have picked up on the ICA’s frustration with the lack of ice facilities in Ireland. The sport has received so much attention during the Olympics. All we need is an Ice Rink and we could be there too. Please also add your name to the Petition for Ice for Ireland and also have a look and like the Ice for Ireland Facebook page and keep watching the curling!! Here’s a link curling on the Olympic website. LK – A successful weekend by the narrowest of margins, can you summarise how you saw the games and the weekend? JJK -We expected it to be a tough weekend and were not disappointed. The first game was really over after 2 ends when we went 6 up but that possibly worked well for Pete’s team as they then had 5 ends of good stress free practice. Game 2, we felt in control and were 3 up but David Whyte had a horrendous pick in end 6 which opened the door for them and they jumped through it to get a 3 back and then my last stone in 7 picks to gift them a two…that was a sore one! In game 3 they just outplayed us throughout and that left us drowning our sorrows in the last chance saloon. An early team meeting on Sunday and a change of strategy and tactics gave us good focus and despite living dangerously with this aggressive game we did enough to get through the last 2 games…just! Fair play to Pete, Peter, David and Tom though, they played a really strong weekend. Ultimately with 5 games of such intensity in a relatively short period, especially in seniors, our ability to rotate our front end with the 5 man squad was a big factor, possibly the determining one. LK – How did the squad format work for you? took a full part in everything, including keeping the rest of us organised, booking meal times and organising the game drinks and nutrition (bananas and jelly beans!). That really typifies the spirit in the squad. LK – How does it feel to win your first Irish seniors title? JJK – It’s great. It is a bit strange to have been World Champions before winning our own Championship but while nothing will ever beat that afternoon in Copenhagen, this came mighty close. Before stepping onto the ice for the final game I reminded the guys how lucky we all are to be participating in a national championship and we should really enjoy these moments. You never know if you will experience it again. Sometimes you just lose sight of the bigger picture and a big part of our team has always been trying to enjoy the moment. I think we managed that for the 5th game and it paid decent dividends. LK – And preparation between now and April? JJK – Nothing planned, I think we need to savour this and maybe have a wee celebration event when my alcohol fast is over. Eventually there will be practice..lots of it!! Our report on the Irish mens senior curling team’s latest sponsorship has been reported in the Irish press. 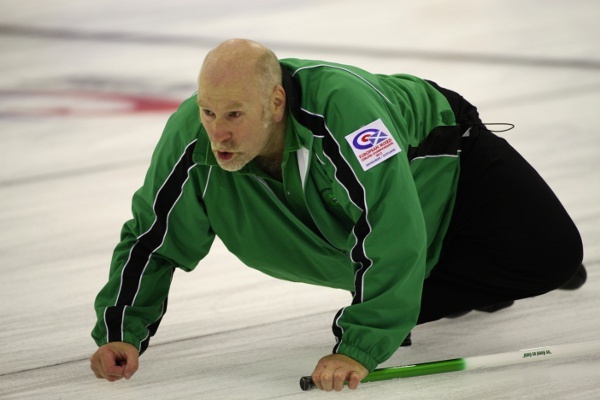 THE recent success at senior level of all those crack junior curlers from 30 – or more – years ago has brought some entertaining photographs to light. The rattle of loft ladders has been heard all over South West Scotland this spring and torches have been shone deep into the ‘glory holes’ of remote whitewashed farmhouses as dusty photo albums have been retrieved. This one has to be my absolute favourite, starring the incoming ICA President on the far right. Ah, the 70s – when top curlers wore woolly jumpers, crimplene trousers and curling shoes with heels. The decade that style forgot. Was there ever a better example……. Neale and Andrew McQuistin, John Sharp and PJ Wilson head off to Canada for the world junior championships in 1975.